This week: Gary Patterson wanted to let Texas know that they’ve made better chicken salad with just salt, pepper and chopped tofurkey. Ohio State showed up to the party and nearly dropped that shiny, highfalutin ice sculpture they made. Alabama brought over some cake with Georgia’s name on it only to shove it in their faces moments later. And, Al Golden wants to know why Map Quest gave him directions to Cincinnati. Everyone promptly asked Golden afterwards why he’s still using Map Quest. I mentioned in last week’s TV Party that Ben Hill-Griffith Stadium had become one of the least intimidating places to play in the SEC since the departure of Urban Meyer. Yet, I forgot to take into account the magic of a 4-0 start under Jim McElwain, a nice corrective to the lack of enthusiasm that was developed under Will Muschamp’s time in Gainesville. A sea of blue and orange painted the television screen as the camera panned a roaring Florida crowd whose elation seemed to collectively scream “We’re back.” As the Florida Marching Band played the ominous notes to “Night on Bald Mountain” during Ole Miss’ various 3rd downs, I was watching a very different place from the one I described last week. It was the same place I remembered seeing in the late aughts. The place that instilled fear into every SEC opponent that walked out of the visitors’ locker room. A place where Chris Leak, Tim Tebow, Brandon Spikes and Meyer loomed large over college football in their domain. On Saturday night, the signage that screams “Welcome to…The Swamp” was not the lifeless pleasantry that it had been for the past seven years; it became a warning, as the Gators beat Ole Miss 38-10. Florida’s reign at the top was defined by an explosive offense and a frighteningly brutal defense. After Meyer’s gossip rag departure from the University, the defensive unit remained sound. Management under Muschamp, however, saw a massive regression in Florida’s bread and butter of explosive offense. In Muschamp’s first year, he was responsible for taking a 58th ranked offense in the Offensive S&P+ ratings and coaching them to an indecent 78th spot in the ratings. The trend would hit continue with an 83rd place in the ratings in 2013 and 72nd in 2014. The biggest outlier was the 2012 campaign where Florida posted a rating at 39 for the year. Yet, even the 2012 stats of S&P+ pale in comparison to the God-like 6 spot that the Gators achieved in 2009. Muschamp’s reign formed an existential crisis for a fan base whose allegiance was formed in the fires of Steve Spurrier’s innovative “fun and gun” and Meyer’s spread option. The lack of a competent offense in the past few years made Florida’s passing game against Ole Miss’ drone-like secondary a revelation. QB Will Grier was sensational for the Gators, posting 271 yards and four touchdowns on 24-of-29 attempts. The insanity of all of it was the fact that he was doing this while battling flu-like symptoms as well as being protected by an offensive line that features three freshmen. For a team that was slow to start, Saturday night was a lightning strike of hysterical madness. The Gator defense was still in its dismantling form, of course. The front seven harassed Rebel QB Chad Kelly and forced him to throw a pick. They also managed to force three fumbles from the Ole Miss offense. In the one-to-one matchup of CB Vernon Hargraves and WR Laquon Treadwell, Hargraves embarrassed Treadwell, who is usually seen screaming down the sidelines past defenders. Hargraves held Treadwell to only 42 receiving yards. The result of the whole was a complete shutdown by the defense in the first half; the Rebels only scored three in the third quarter and seven in the fourth. It allowed the Gators plenty of time on offense to throw the ball around and let Grier dominate the third ranked team in college football. 5-0 is a wonderful position to be in for the Gators especially after enduring multiple seasons under Muschamp in which every game seemed a likely loss due to a woefully incompetent offense. Some of that defeatism even carried over into the expectations of McElwain’s first year, which is hilariously evident in Florida fan and SBNation editor Spencer Hall’s SEC preview. But now, with the way that the Gators are playing on offense, the outlook is much more optimistic. You have to hand it to Clemson. They really tried to gift wrap a game for Notre Dame despite an 18-point lead through three quarters. Instead, they managed to stave off an Irish comeback; the rally ended on a failed two point conversion that would’ve sent the game into overtime. There is something to be said for how the Tigers managed to let the Irish come back into the game though. You can chalk it up to the horrifying amount of rain that came from Hurricane Joaquin, or you can hand it to the sputtering offense that failed to score anything but a field goal after the half. There’s also the defense, which deserves its fair share of the blame, allowing DeShone Kizer throw all over the Tigers in the final minutes. Nevertheless, they didn’t do the one thing for which they have earned a reputation, and that’s good enough. You can say the same thing for their offense, which looked pedestrian. Deshaun Watson completed 11-of-22 passes for 97 yards, two touchdowns and an interception. The rushing attack was a bit more effective, with Watson and RB Wayne Gallman each racking up a little over 90 yards on the ground. Clemson’s offense didn’t really need to do all that much since Notre Dame handled the ball about as effectively as a bar of wet soap dipped in petroleum jelly. It was ultimately four turnovers that killed Notre Dame’s chances against the Tigers. It set them way behind schedule in scoring and, with the way Clemson’s defense shut down any Irish attack, everything seemed out of reach until it wasn’t, and then it was again. The game was ridiculously sloppy due to the weather, and, in the end, Clemson was the cleanest person in a mess hall after a food fight. As always, the name of the game in college football is survive and advance, and it doesn’t matter how you do it. The Tigers get another week of enjoying life as an undefeated, with all of its hearty trappings and national publication ink. From the looks of their schedule, they might get to enjoy that for a few more weeks. The two toughest opponents left on their schedule – Georgia Tech and Florida State – are both home games. The Yellow Jackets don’t look anywhere near as good as their preseason outlook suggested, and the Seminoles, while undefeated, have looked sleepy against both Boston College and *gasp* Wake Forest. All in all, despite close losses to lesser and thinner teams, Clemson has it made for the rest of the season. However, there is still that lingering, inexplicable cosmic force which has dictated the Tigers’ fate ever since the Danny Ford era. You know what it is, I know what it is, and it really clouds my judgement when it shouldn’t. But, consistency as a program helps, and there is not a lot of anything on the field that is giving me any high hope that they will make it past November 7th with less than two losses. The Tigers should be glad to know that their social media director is Playoff worthy though. November 27th was considered a huge date in determining the four Playoff teams before the season began. The significance of that date was that it would be a de facto Big 12 championship game between highly touted, bitter TCU and highly touted, bitter Baylor. Both teams returned a fair amount of fire power in order to facilitate their ascent to the top and, with the Big 12 field looking as it did before the season began, it was seen that the conference would get its shot on the back of one of Texas’ nouveau riche. This was all before Oklahoma decided to knock the snot out of the conference’s most statistically efficient defense in West Virginia on Saturday, of course. 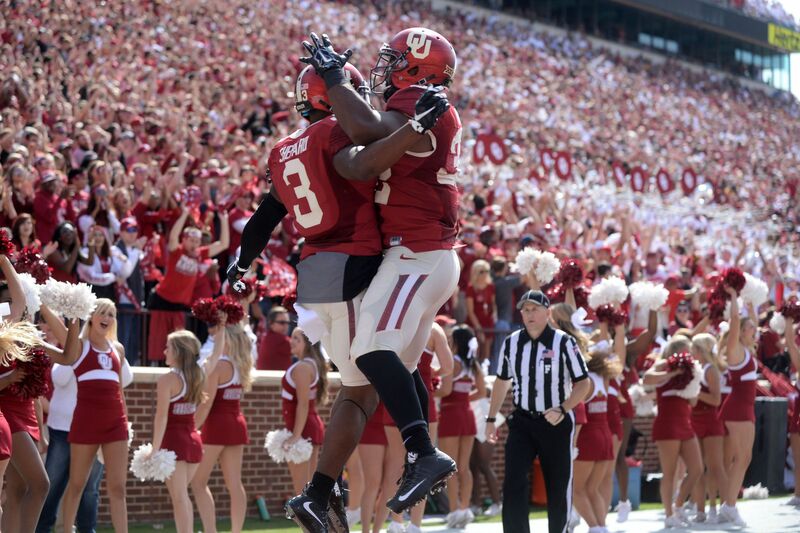 The Sooners, up until Saturday, were considered a team that needed to prove itself¹. The road victory over Tennessee was great in the glow of the Sunday afterwards but since, it’s looked like the Sooners were the benefactor of Butch Jones’ status as a shook one. The game against the Mountaineers was seen as an indicator of whether or not Oklahoma’s new/old air raid system would stand up to the test of a confident defense. The result was a 44-24 beat down in which Baker Mayfield threw for 320 yards, three touchdowns and an interception. The play calls were not the most balanced, especially with RB Samaje Perine getting only 16 carries, but Oklahoma does have the running game to fall back on if Mayfield becomes inconsistent. They also have a defense that forced West Virginia QB Skyler Howard into pressure and forced the Mountaineers to run. Despite Oklahoma’s dominance on Saturday, the most pressing issue was their run defense which gave up 111 and 72 yards to RBs Wendell Smallwood and Rushel Shell, respectively. A testament to West Virginia’s ability to spread Oklahoma horizontally and create wide open running lanes. The Sooners were able to adjust after a barrage of rushes in the third quarter but the nearly 200 rush yards are troubling to see if you’re a Sooner fan and watched Baylor play this weekend. The Bears ran for 368 yards and five touchdowns against Texas Tech; RB Shock Linwood accounted for 221 of those yards as well two touchdowns. It might not be fair to compare Tech’s run defense to that of Oklahoma but when you’re giving up 183 yards to a team whose primary speciality is airing it out, there’s a bit of concern. The Sooners might have proved that they should be in the conversation but it’s going to be a hard act to stay in that conversation. The most balanced team in the Pac-12 now looks like every other team in the conference after UCLA lost in a 38-23 stunner against Arizona State. QB Josh Rosen went back to looking like a freshman with a QBR of 37.5 and an interception on the stat line. The Sun Devils rushed the Bruins constantly and the once effective ground game of RB Paul Perkins was limited to just 63 yards. The Bruins have now been reduced to Pac-12 South title contender rather than overall favorite. I know nothing and neither do you in the Pac-12. Ohio State scraped by an Indiana team 34-27 in Bloomington. Do the Buckeyes look like the best team in the country? They look more like the mirror image of a team from last year who were the reigning national champs. Urban Meyer is in his own head and he doesn’t know how to get out until they give up a game to Penn State to alleviate some pressure. Hey, they did this twisted form of shiatsu massage with Virginia Tech and things worked out. Does the bleeding ever end for the Texas Longhorns? After two special teams disasters in Week 3 and Week 4, they were swallowed whole by TCU in a 50-7 rout. QB Trevone Boykin threw for 332 yards and five touchdowns, making the Longhorns look more like Kansas than the powerhouse of years past. It’s bad. Real bad. Players are jumping ship at halftime and the Texas Rangers are tweeting then deleting opinions. Something has gotta give for Texas. Northwestern completely blanked Minnesota 27-0, a team that I thought could win the B1G West. The way that Stanford has played offensively in the wake of the loss to the Wildcats suggests that Northwestern is not something to be taken lightly. Which, yeah, sure, everyone saw this coming. You know what else everyone saw coming from a mile away? Iowa being 5-0 after a 10-6 win against a ranked Wisconsin in Camp Randall. Iowa at 5-0 was about as predictable as Donald Trump leading the Republican candidates. This is what happens when you underestimate the tenacity of people in middle America. The same kind of people who still believe that gun control means using both hands. Texas A&M ripped through Mississippi State 30-17. They did it even though QB Kyle Allen wasn’t particular efficient. The problems with efficiency are clouded by 322 passing yards and two touchdowns. It was a nice performance but one that doesn’t really instill a lot of confidence in A&M’s shot at breaking out from the SEC West’s crowded middle tier. Put away your “Alabama is dead” posts and your articles about the dynasty is over. The Tide rolled over Georgia as if they were Middle Tennessee in a 38-10 pummeling. Yet, if you want to post some more clickbait when they lose again, sure. I respect your hustle and I tip my hat. Welp, if you didn’t think it could get any lower Tennessee, it just did. Losing to Arkansas 24-20 is much like losing to that one kid in the neighborhood who isn’t very good at anything but, once he beats someone at something, he won’t stop talking about it. The Volunteers picked the absolute worst time to be walking by the community pool’s basketball goals. CAL IS 5-0 BECAUSE OF AN INSANE 3RD AND FOREVER DRAW PLAY. BEAR RAID FOREVER!!!! ¹It’s funny that Oklahoma, one of college football’s enriched blue bloods and most consistent programs under Bob Stoops, even needs to convince people to notice them. But much of that has been due to recent years, with nine- and ten-win ceilings that have only blown people in short bursts.